Christmas Eve in the year 3060, and the planet Puxatornee is home to a prosperous human colony. A space craft has arrived in orbit carrying the Slithergees, a race of obsequious alien slugs. Their home world has been destroyed and they are humbly requesting permission to settle on the first moon. And if they don’t get permission, then they are humbly threatening to declare all-out war. The future hangs in the balance. The decision rests with Bailey, the colony’ s president – but she has other things on her mind. Sylvester McCoy is the Doctor in…Flip-Flop. For the past 40-plus audios, Big Finish has dedicated themselves to firmly carving out a niche among the expanded Who universe with plays and serials that could have been right at home on television, with several of them of high enough quality to be ranked among the best Who stories ever told. Over that time, Big Finish hasn’t been afraid to allow their writers to experiment with the freedom that the audio format provides. Removed from the budgetary limits that special effects and multiple shootings locations cause has given us stories such as Seasons of Fear and Whispers of Terror. At the same time, the urge to push the envelope has given us stories such as Minuet in Hell and Nekromanteia. But setbacks and subpar audios haven’t stopped Big Finish from trying new things. Several of the lastDoctor Who audio reviews I’ve done have covered some experimental and creative scripts and presentations of the narrative. We’ve had a musical (well, a serial with a musical episode), there’s been a story told completely out of order, and we’ve had two separate-but-concurrent stories told in one audio play. Flip-Flop is a unique type of story. Two back-to-back episode come burned to a White CD, while two other back-to-back episodes come burned to a Black CD. What makes Flip-Flop different is that one can listen to the Black CD first, and then the White one, or the White CD first, and then the Black one, but still walk away with the exact same story! 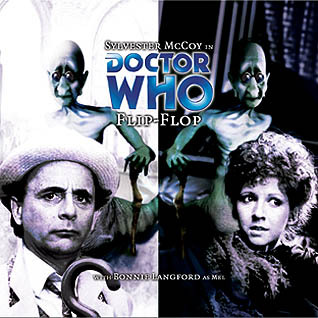 Scripted in such a way that either CD could be the “beginning” of the story and the other CD could be the “conclusion” of the story, Flip-Flop explores a concept of Doctor Who that is often mentioned, but rarely carried out; just what does happen when one directly meddles with history again and again? Christmas Eve, 3090. In thirty years, the Slithergee have colonized both of Puxatornee’s moons and a large portion of the planet’s surface. Humans been reduced to sight guides for the poor, blind Slithergee, and now the Slithergee are quietly suggesting that the committee focusing on humanity’s dwindling rights is unfairly stacked with human representatives. The Resistance is down to two fighters, Stewart and Reed, who have a desperate plan. Having secretly constructed a time machine, the two will go back in time to the night President Bailey agreed to the proposal and assassinate her. When the Doctor and Mel arrive in an effort to seek rare Leptonite crystals that will allow them to fight the Quarks, Mel is the one who is taken back in time, and the Doctor must travel back in time in order to save her, but risk allowing the assassination to take place and damaging the Web of Time via the change of history. Christmas Eve, 3090. Puxatornee is a radioactive, bombed out ruin. Rations are running low, and tough choices must be made. The Slithergee are dead, but the colonists are not far behind. When the Doctor and Mel arrive in an effort to seek rare Leptonite crystals that will allow them to fight the Quarks, they are arrested by the paranoid security forces as being Slithergee agents. When the Doctor lets slip that they have a time machine, the head of the security forces, Stewart, and his associate Reed, have a plan. Using the Doctor’s TARDIS, they will go back in time to the night President Bailey was assassinated and save her life, pleading for her to appease the Slithergee and avoid the destructive war. Even though a life will be saved, the Doctor risks allowing one life to be spared and damaging the Web of Time via the change of history. A lot of credit has to go to scriptwriter Jonathan Morris for his work on Flip-Flop. He managed to create one story that easily becomes two stories, depending on order of listening. Morris pens a story that, no matter what way it’s enjoyed, doesn’t have a beginning and doesn’t have an ending. It’s a circular tale, one that turns back on itself like an Orberus snake swallowing its own body. There are two points where a listener can jump into the story, but the only way to conclude the story is to actually turn off the CD player/close the file! Otherwise, the story goes round and round again, back and forth, over and over for time eternal. For a show about time travel, it’s very rare for Doctor Who to directly address why meddling about in time is a very bad idea. Not only for the butterfly effect, where one little change can have massive repercussions, but because one risks being locked in a temporal loop the more one tries to change history. This very concept has been explored from both sides in previous serials, specifically The Mutant Phase and The Time of the Daleks. Flip-Flop is a direct study of what happens when time changes. Everything is different, but still the same. Both White and Black CD’s have the same characters (minus the Slithergee on the Black CD) but in slightly different situations. One CD flows into the other and vice versa. I could only imagine the headache Mr. Morris must have had and can see him hunched over a flowchart, trying to make sure everything makes sense. And somehow, it does. How can the Doctor and Mel take part in “both” CD’s and not get caught in the temporal loop themselves? By, in both timelines, landing at the exact same time; 11:55 pm, December 24th, 3090, and departing at the exact same time; 11:55 pm, December 24th, 3090. It’s a brilliant piece of writing that lets the Doctor and Mel experience both timelines and still manage to “escape” at the end. The best way to get the most out of Flip-Flop is listen to the story as either White-Black-White, or Black-White-Black, as it sets the story out through the first two CD’s, and the re-listen of the first CD can provide a few “ah-ha” moments for the listener as they pick up a few of the other CD’s moments through the dialogue and actions of the characters. This is a story that I feel could really use a follow-up. Does the paradox ever get broken? Does having time repeat itself over and over again in the same loop strengthen the Web of Time like scar tissue, or does it stretch and weaken the temporal fabric until it snaps? Then again, could one ever revisit a temporal loop without getting caught in its effects? Though, of course, there is one big, and it’s a BIG, plot hole – in both the White and Black timelines, the Doctor and Mel arrive seeking Leptonite crystals with which to fight the Quarks, the robotic servants from the Second Doctor serial The Dominators. In both timelines, they manage to obtain the crystals and head back to destroy the Quarks…but which Doctor and Mel pairing arrives to take care of them? The White timeline pair, or the Black timeline pair? It’s a simple question, but one that threatens to unravel the carefully constructed timeline(s) that Morris has created. Sylvester McCoy rebounded nicely from the twin dilemmas of The Rapture and The Dark Flame with his turn in Project: Lazarus. Flip-Flop’s script was practically made for the Seventh Doctor, especially during his travels with Melanie Bush. This is one of McCoy’s finer performances, walking the line between “over the top” and “melodrama” with perfect balance. There’s plenty of technobabble of course, and with several people running around from both White and Black timelines simultaneously, there’s a lot to keep track of; who’s who, where’s where, and what’s what. McCoy strides through this serial like the Doctor knows exactly what’s going on, being coy, playing dumb, and managing to get him and his companion into trouble but without getting hurt in the process, all the while being the goofball Doctor. Until, that is, he’s faced with the possible unraveling of time itself, at which point the kidding around stops. It’s in these moments that McCoy plays it gravely serious, only doing what he has to do under the threat of danger to his companion. Mel: But, Doctor, we know they can’t change history because we’ve seen the future already. 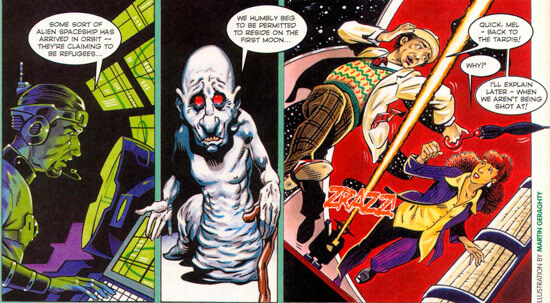 Seventh Doctor: No. Unfortunately there is an awkward thing called “free will”. Mel: Oh. You mean that predeterminism is merely a philosophical abstract and that the physical reality of the universe is the one in which all potential actions are permitted, including those whose effect cancel out their own logical cause? Flip-Flop gives us a supporting cast that, for the most part, have to juggle two roles; the White timeline and the Black timeline. Luckily for the listener, the players manage to do so with ease, but the two “lead” secondary characters don’t exactly bring enthusiasm to their parts as resistance survivors/fascist secret police. Francis Magee’s Stewart and Audrey Schoelhammer’s Reed are horrified by what their decisions have wrought; the assassination of President Bailey brings about a blasted ruin, while the saving of President Bailey brings about a colony under the Slithergee’s slime trails. They play their parts as very “matter of fact,” almost as if they know just how futile their actions are but know they’re stuck in their roles. It’s a bit of a letdown as they’re supposed to carry a bit of the temporal weight. President Bailey, played by Pamela Miles, struggles with her decisions as either the negotiator with the Slithergee or their puppet President. Her sense of being distraught is palpable and her fate in either timeline is one of “tried to do the best with what they had,” even when it turns out she’s not as “white” as the fascist Stewart/Reed think or as “black” as the revolutionary Steward/Reed think. Professor Capra is either a desperate scientist who’s building a time machine to save his family from their fate at the hands of the fascists, or the Slithergee’s head interrogator who whistles a happy Yuletide tune even as he’s turning up the agony device on the Doctor and Mel, and Trevor Martin keeps it quiet and full of despair/full of cheer the entire time! It’s Daniel Hogarth’s Slithergee, though, a kowtowing race of space slugs that stand-out, and by stand-out, I mean I wanted to punch them in the teeth so bad. The Slithergee are a case of political correctness gone horribly wrong, where positive discrimination has become a weapon. The poor, humble Slithergee are having their rights trampled on because the concept of Christmas is alien to them, so it should be replaced by “Slime Time Solstice” so the Slithergee are not offended. If that isn’t “The War on Christmas” and “white privilege” flipped around and skewered…well, this white male who celebrates Christmas definitely felt the point was made. Daniel Hogarth manages to make “humble” and “deadly” two sides of the same coin, and I would love to hate the Slithergee again in future audios. Peter Davison is the Doctor in Omega. This entry was posted in Big Finish Review and tagged 3/5, Big Finish, Doctor Who, Mel, Seventh Doctor, Sylvester McCoy, TARDIS. Bookmark the permalink.